It’s been over a week I know since I posted a new blog post but the past few weeks have been crazy busy, Christmas is definitely coming so fast and I’ve been trying to get on top of my shopping list, visiting Christmas markets and a trip to Birmingham to The Clothes Show has been taking up all of my weekend time. I’ve also been patiently waiting for lots of parcel orders to arrive, The Black Friday sales gave me an opportunity to buy a few Winter pieces one of which being a warm winter coat, every year I buy a new coat and I try to choose classic styles so they will last me years. With lots of websites offering up to 50 percent discount on Black Friday one new coat led to three new coats (oops!). I’ve tried to stick to neutral colours so that they can be worn over most outfits and can be styled up with a patterned or check scarf, a warm hat or maybe a faux fur collar to give a plain coat a touch of luxury. This light beige coat I wore on my trip to london kept me very warm, I tend to suit the single breasted style as I’m quite broad in the shoulders and I also like a longer length for my height. This colour is a kind of oatmeal shade almost cream and works over an all black outfit or shades of greys and blush pinks. One of my favorite Winter coats and an absolute must have is my camel coloured one, you can pull it out every year and if you invest in a decent quality one it will never get old. I’ve worn this coat a lot over the last few weeks, it looks great with jeans and a stripe top, a crisp white shirt or a cream chunky cable knit sweater. This grey boyfriend coat is a new addition this year from Topshop, I actually bought it back in september when all the new Winter season fashion was just arriving in the shops. I sometimes make the mistake of pondering on a decision to purchase or not and then it sells out. I’ve been on the look out for a grey coat for a while and this one took me perfectly from Autumn to Winter, it also comes in black, camel and I think a plum/burgundy shade. 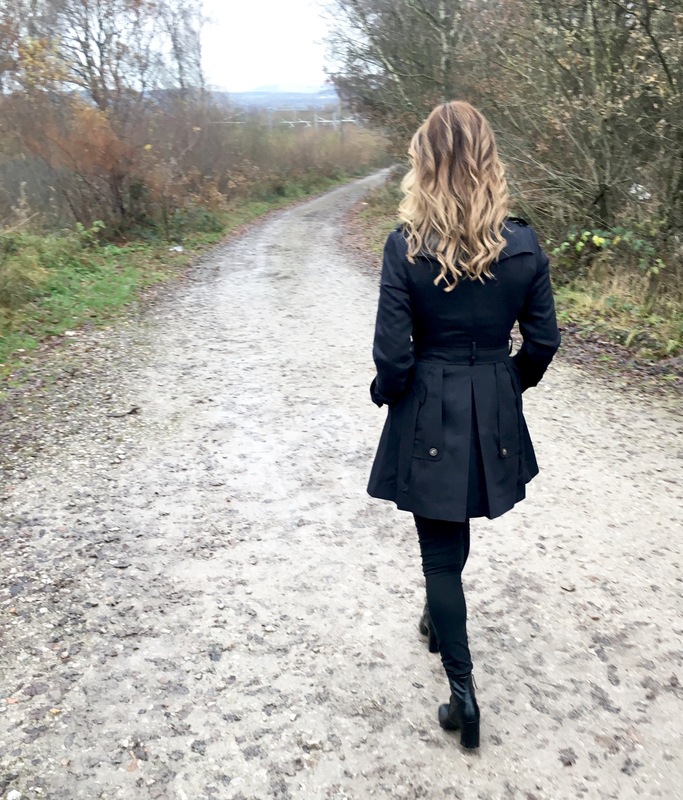 A classic trench coat can instantly smarten up any outfit, and although this one looks navy blue on the picture it is in fact black, I got this one from ASOS on Black Friday, it’s a skater style so flares out nicely with a neat pleat in the back. I prefer this style as sometimes I find with trench coats when I tie the belt there can be an excess of fabric and it can bunch up a bit and make me look a little thick waisted. Once again this would look amazing with a patterned scarf, I’ve got my eye on a Burberry one, that’s on my Christmas wish list haha! 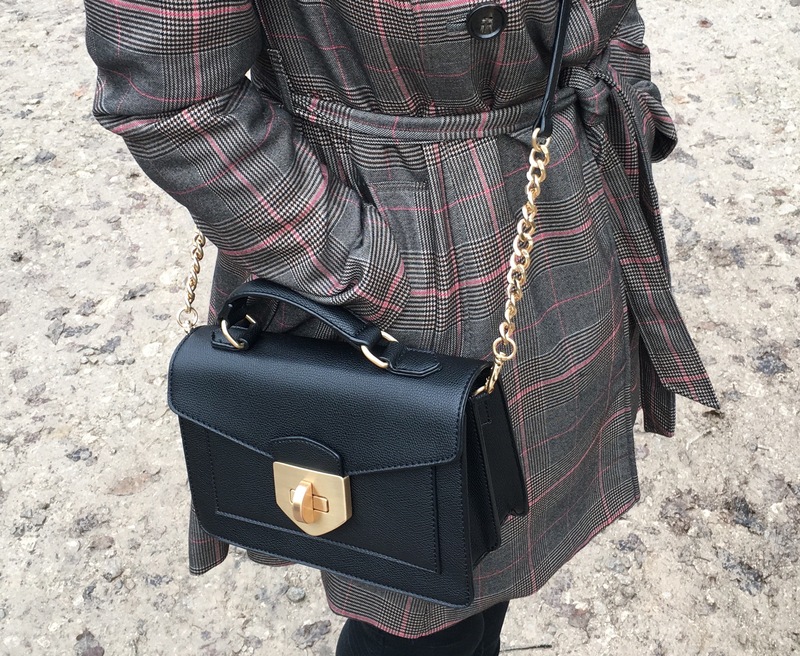 My final favorite coat is yet another trench coat this time in the current check trend. it has a brown tone to it and the little touch of pink just brightens and lifts me on a dull Winters day here in the UK. I usually don’t go for bold prints or patterns but fell in love with this coat and every time I wear it I get so many compliments, it must suit me. The fabric is quite thick for a trench coat so it is remarkably warm worn over jumpers or layers. I hope I’ve given you some Winter inspiration and id love to know which coat is your favorite or what style is your go to warm coat or jacket this year.